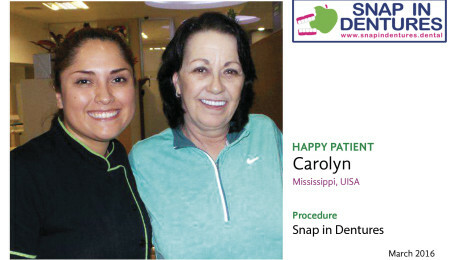 Snap in dentures: Happy Patient Carolyn! Sometimes it is necessary to get a change in your life you are tired of a special thing or for health. The problem of not being able to bite properly, or have years unable to eat solid meals might be extremely annoying and also bad for your digestion and nutrition, things that affects directly to your whole health and it could be the first thing you want to change back in your life. This time, we were privileged to have a radio producer as a patient for Snap in Dentures! 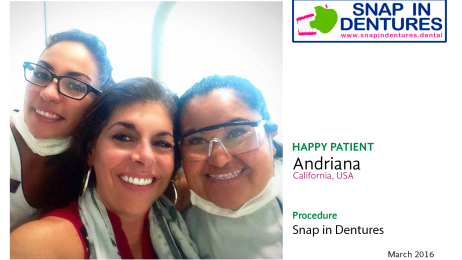 Our dear patient Andriana came from California looking for help and we were happy to provide a solution. She had looked for similar options in USA but these would have been at least around $36,000 USD. She then went to look at our website and decided to go for it! Because, why not? You get an amazing vacation in Cancun while you wait for your Snap in Dentures to be finished, and you can also go swimming and sunbathe in the beach… or you could simply enjoy the ocean breeze under the shade of a palapa. Before getting Snap in Dentures in Cancun, Gail had gone through plenty of other dental treatments trying to find a solution to fix her teeth. She spent thousands of dollars but her dental work was not helping, and her teeth started to break off at the gum line. Snap in dentures happy patient Pania! The happy patient we would like to tell you about today got her snap in dentures with us. She is from Hawaii and she tried fixing her teeth with other doctors several times but she couldn’t get the treatment done. They said “We can’t help you”. She told us that she hated the dentist because of that but now she is happy she found a good dentist like us and she is going back home with her snap in dentures. 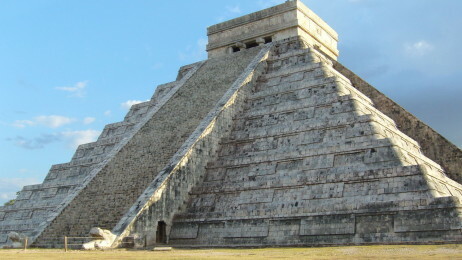 Now that spring is almost here, we want to give you an interesting option you can do after you get your snap in dentures in Cancun: Chichen Itza on March 21st to see an event that only happens twice a year.